Update 08 April 2017: Elon Musk tweeted an indication that they're revisiting the possibility of second stage recovery, so this question is again relevant, and the details of the new solution may be different from the old. Fairing is ~$5M, but that should be reusable this year. Am fairly confident we can reuse upper stage too by late next year to get to 100%. The upper stage will be coming in a much faster trajectory, so they have to add a full heat shield at the front of the stage. At first glance, the much shorter second stage would seem to need shorter legs because its center of gravity would be lower, but the upper stage version of the Merlin engine has a very long nozzle, which is radiatively cooled -- which means exposed, not shrouded, so the legs will have to mount quite high, and be fairly long (and thus heavy). The biggest problem, however, would seem to be the engine throttling. The empty upper stage weighs something like a quarter of what the first stage does, but will be firing almost the same thrust level. Are they going to try to throttle deeper? 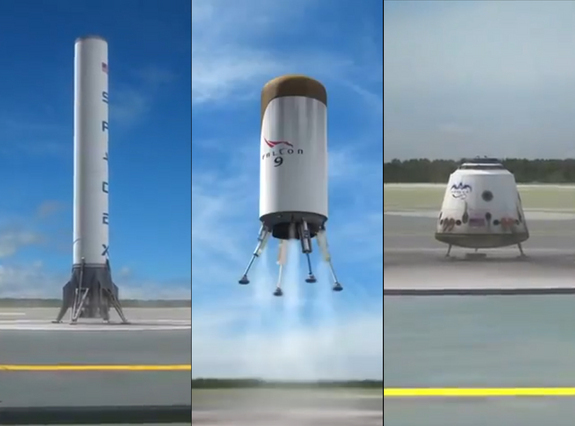 Are they going to do the same hover-slam trick as the first stage, only on a much shorter timeframe? Are they going to add 2 or 3 Kestrels alongside the Merlin on the second stage and land gently on those? Parachutes? Airbags? Really big pogo sticks? 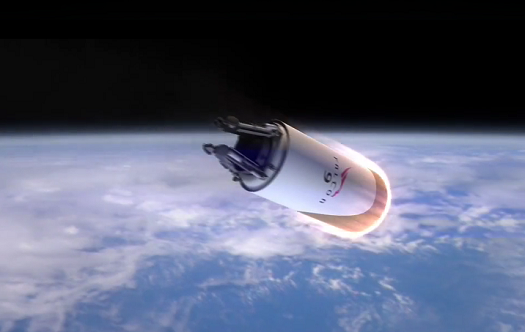 Second stage reuse for Falcon 9 was a planned feature that has been discontinued. In this old render(Shows a Falcon 9v1.0 with square engine block) you can see a reuse plan very similar to what you described. The second stage nozzle would retract into the tank structure, small legs would deploy, and smaller engines(kestrel, draco?) would perform the actual landing. However, second stage reuse is hard. The first stage is a massive beast that does most of the heavy lifting into orbit. However, the second stage provides most of the speed. Once the second stage inserts Dragon into orbit, it would need to have enough fuel to deorbit/intersect the atmosphere then use a heavy heatshield to reduce its velocity on reentry. All of these things add weight. Due to the nature of staging and the rocket equation, roughly every 4 pounds of dead weight on the first stage takes away 1 pound of payload. On the second stage it is a 1:1 conversion. All the extra weight for reuse(heat shield, legs, extra fuel, machinery for nozzle retraction) take away from the total payload mass. The next generation vehicles after the Falcon architecture will be designed for full reusability. I don't expect the Falcon 9 to have a reusable upper stage, just because the - with a kerosene-based system, the specific impulse isn't really high enough to do that, and a lot of the missions we do for commercial satellite deployment are geostationary missions. So, we're really going very far out. These are high delta-velocity missions, so to try to get something back from that is really difficult. But, with the next generation of vehicles, which is going to be a sub-cooled methane/oxygen system where the propellants are cooled close to their freezing temperature to increase the density, we could definitely do full reusability - and that system is intended to be a fully reusable Mars transportation system. So, not merely to low Earth orbit but all the way to Mars and back, with full reusability. [Within 3 years?] Ha. I am an optimistic person, but - I think we could expect to see some test flights in the five or six year time frame. But, we're talking about a much bigger vehicle, and we're also going to be upgrading to a new generation - a harder engine cycle, which is a full-flow staged combustion. What we have right now is an open cycle engine. Right now, I'd say, engines are our weakest point at SpaceX, but they will become as strong as the structures and avionics in the next generation. One possible thing which might help is to switch to methalox on the second stage to get additional performance to pay for grid fins and a heat shield. The subscale raptor engine they tested back in September 2016 has a thrust of 1MN, which is similar to the uprated thrust of the vacuum merlin 1D. The engine is also of a similar size. The dimensions of the second stage can't change much but methane's lower density than kerosene is somewhat offset by the higher O/F ratio and LOX's high density. After they got launching seriously, SpaceX decided that second stage recovery would be too difficult, and still maintain a useful payload. This indicates that the better ISP of the Raptor engine under development for Mars missions might make it possible. Not the answer you're looking for? Browse other questions tagged falcon-9 reuse asds merlin-1d kestrel or ask your own question. How is SpaceX going to land their Falcon first stage? When do the landing legs on a Falcon 9R first stage deploy in a landing attempt? How low can the single Merlin engine on the Falcon 9 first stage throttle? What makes the Merlin vacuum engine so deeply throttleable? Was Sea Dragon second stage reusability ever plausible? Does the Falcon 9 charge its batteries during flight?